We are very pleased to debut a brand new U.S. poster for We Bought A Zoo in glorious high resolution. We really hope you like it! Tell us what you think! Do you like the new poster? Love it! The paw prints and the hand prints making up the tree is really great. Love the poster… Reminds me of something “EMEK” would design. Who was the artist? Yeah, please try and find out. Thanks Greg. 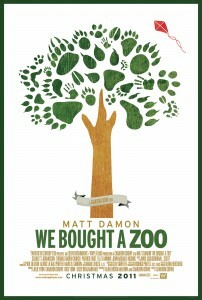 ‘We Bought a Zoo’ | Pósters | Demasiado Cine! No specific artist everyone. It was put together by the Fox Marketing Team. The design team http://www.arsonal.com/ has it on their website. You’re kidding! A “team” put together something so whimsical and poetic? Most beautiful movie poster in recent years! Is the poster available to purchase? I’m in Taiwan.